These findings are described in the article entitled Gravity-mediated Dark Matter models in the de Sitter space, recently published in the journal Physics of the Dark Universe (Physics of the Dark Universe 22 (2018) 67-73). This work was conducted by Ion Vasile Vancea from the Universidade Federal Rural do Rio de Janeiro. 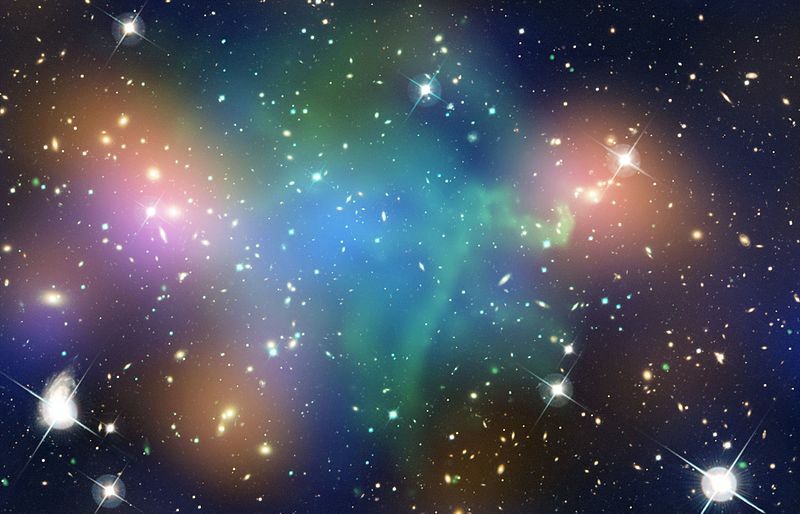 Dark Matter is the paradigm that seeks to explain the excess of gravitational force necessary to hold together the galaxies as well as the galaxy clusters and galaxy groups. The clue that there should exist this exotic form of matter that interacts at most very weakly, if at all, with baryonic matter (from which electrons, protons, and neutrons are made of) through the electromagnetic weak and strong interactions, but very strongly through the gravitational interaction, comes from a large variety of observations of the velocities and spectra of the galaxy clusters and of the anisotropies in the cosmic microwave background. These observations indicate that if our present theoretical models based on the General Relativity are correct, than more than 90% of the dynamical masses of the galaxies and galaxy clusters should be made of Dark Matter. Due to this discrepancy between this theory and astronomical observations, understanding the microscopic nature of Dark Matter represents one major challenge of contemporary Physics. Currently, there are several undergoing experiments around the world at LHC, CDMS, Gran Sasso, Fermilab, LIGO, LUX-ZEPLIN, LSST, and PandaX, to cite some examples, which are hunting for Dark Matter particles. But in order to be effective, the experiments must be fed with theoretical models of the search for Dark Matter particles and of their interaction with the baryonic matter of which the detectors are made. One interesting class of models, known as the simplified models, have been attracted a lot of attention lately. The simplified models are effective models in which Dark Matter particles are hypothesized to have similar properties to baryonic particles, obeying the same symmetries and principles and interacting with the baryonic particles through the known mediators, albeit with a much weaker interaction strength. Thus, the simplified models give a very precise description of the Dark Matter microscopic structure as well as its interaction with the baryonic matter, all in terms of particle accelerator observables. However, since no positive signals have been detected in accelerator experiments so far, but there has been a lot of evidence in favor of the Dark Matter from the astronomical observations, why not try to search for traits of the Dark Matter particles as proposed by the simplified models in astronomical and cosmological data? In order to work, the simplified models should be taken to the next level where the information about the gravitational environment and the behavior of the Dark Matter in it should be taken into account. For example, by knowing that the gravitational interaction between the Dark Matter and the baryonic matter is predominant, the natural mediator of the interaction is the graviton. Also, since many astronomical observations are based on the Cosmic Microwave Background Radiation, which is a snapshot of the early Universe, the information on the structure of space-time at that epoch is included by considering the de Sitter space, which describes a phase of accelerated expansion in the primordial cosmology. The new simplified model of Dark Matter with graviton mediators in the de Sitter space is a harder theory than the usual Quantum Field Theory in the space-time of accelerator physics due to the difficulties inherent to the Quantum Mechanics in the de Sitter space, like the definition of the vacuum state and of the quantum particles. One way to attack the problem is to map space-time into a four-sphere where Quantum Mechanics is well behaved and to solve there the details of the model first and then to interpret the results in terms of physical quantities in the de Sitter space. Other more direct approaches to figure out the properties of the gravitating Dark Matter in de Sitter space are also possible. By using a combination of theoretical concepts and techniques from Quantum Field Theory, General Relativity, Particle Physics, Cosmology, and Observational Astronomy, the simplified models provide a means to test various hypotheses on the quantum structure of the Dark Matter against the observational data. Ion is a research scientist at the Grupo de Física Teórica e Física Matemática, Departamento de Física, Universidade Federal Rural do Rio de Janeiro.